September 12, 2014, Saitama, Japan. - Tamron Co., Ltd. (President & CEO: Morio Ono), a leading manufacturer of precision optics, announces development of a new ultra-wideangle zoom lens for full-frame DSLR cameras with a fast F/2.8 aperture and VC (Vibration Compensation), the world’s first in its category. The price and launch date are to be determined. The lens will be showcased at the Tamron booth at Photokina 2014, September 16- 21, 2014 in Cologne, Germany (Photokina Booth Number: Hall 4.2 D10 - E19).Since 2012, Tamron has been expanding its lineup of interchangeable lenses for 35mm full-frame DSLR cameras. SP 24-70mm F/2.8 was the first in the series, being integrated with VC, followed by the 70-200mm F/2.8, 90mm F/2.8 Macro, and 150-600mm F/5-6.3. The array of those new lenses have been highly acclaimed among the photo enthusiasts and working pros around the globe. 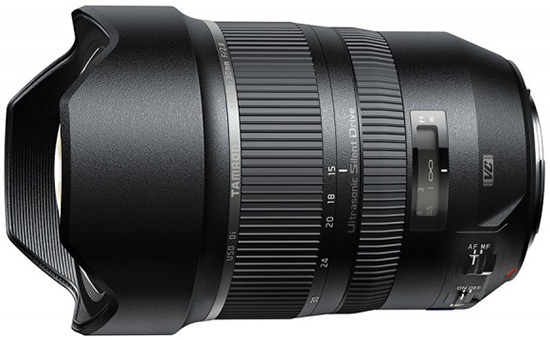 To address the needs for more towards the wider angular field, Tamron spearheaded the development of SP 15-30mm F/2.8 Di VC USD, a fast ultra-wideangle zoom lens with the image stabilization feature, setting itself apart from the rest of zooms in this category. This entry was posted in Tamron and tagged Photokina 2014, Tamron SP 15-30mm f/2.8 Di VC USD full frame zoom lens. Bookmark the permalink. Trackbacks are closed, but you can post a comment.